Every now and then, as you wake up kind of rested in the morning, you wonder if there’s something else that you could try to sleep just a little bit longer in the morning. It’s not that you don’t like the birds singing in the morning, or simply adore your neighbor’s dog (well, not that much when he barks at 5 in the a.m. …). Any solutions for the noise reducing part? No, it’s not your memory foam pillow; it’s not your mattress cover either. It’s… your curtains! Yes, the best soundproof curtains are able to keep away outside noise, thus providing you a nice, quiet night and day. Quite something, right? Our top 10 is done. Take your pick! 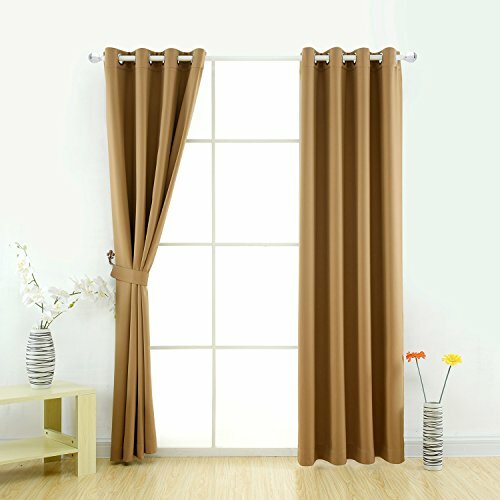 Going shopping for curtains on a short budget doesn’t mean you should settle for less, as it’s not impossible nowadays to find curtains that are able to keep unwanted noise away. It’s the case of the Best Home Fashion Thermal Insulated Blackout Curtains that are pretty good in creating a darker room and give you privacy as well. The innovative triple weave fabric build of the curtains is responsible for keeping sunlight and bad UV rays away from your room. The curtains are able also to insulate against heat and cold. This means your room remains fresh cold in the summer, nice, and warm in the winter. This has a good say on your budget also. The curtains are able to block also unwanted noise so your sleep is improved. As the room gets not only darker, but also quieter, there’s no more reason for you not to get a good nap during the day. As for the versatility of the curtains, it’s nice to know that you have around 16 colors to choose from. They feature back and rod pocket hanging styles, which gives you more options when it comes to styling them. They are made of good quality 100% Polyester and are easy to take care of. They are machine washable and it’s better to use non-chlorine bleach when in need. You may tumble dry low and warm iron if it pleases you. They may be easily draped. They have a nice, soft texture and look pretty good. They wear no smell and come in two panels. In order to get a nice appearance and efficiency, keep in mind that panels should always measure 2-3times the width of your window. If you take a look at the big picture though, you can see some nice looking and pretty efficient curtains when it comes to creating a darker, noise reduced, insulated room. When you value your privacy more than anything, but also enjoy a darker room to get some rest or watch a favorite TV-show, give it a go with the Absolute Zero Velvet Blackout Home Theater Curtain Panel, 95-Inch, Black. These panels bring many good features to the table so you need to take a better look at them when shopping. They block almost 100% of intrusive light and are able to minimize unwanted noise just as well. These two combined give also thermal advantages and you get to do some energy saving also. The explanation behind the curtain’s abilities comes from the foam-back construction, which means it’s made with multiple passes of soft, white foam that raises the insulation abilities, damps the noise and creates an efficient barrier to sunlight. The professional method of foam application lets the foam bind entirely to the face fabric, giving a single, more efficient panel. The smooth velvet fabric creates the feeling of real theater curtains, giving you privacy and a nice feel when watching the movies. They make a great choice as home theater, bedroom when you don’t want any light inside the room. Another quality for them is their length-95 inch- which is so difficult to find and nevertheless, so appreciated. The panels are made of 100% polyester, which means they are easy to take care of. You may machine wash them, tumble dry low and even iron. They are easy to iron, by the way. The fabric has a nice texture and the curtains are true to color. As they are highly efficient in keeping light and unwanted noise away and creating a theater, darker room, and the Absolute Zero panels make a nice, efficient option anytime. Just because you go shopping on a fixed budget, it doesn’t mean you can’t get a good option for some noise reducing curtains. 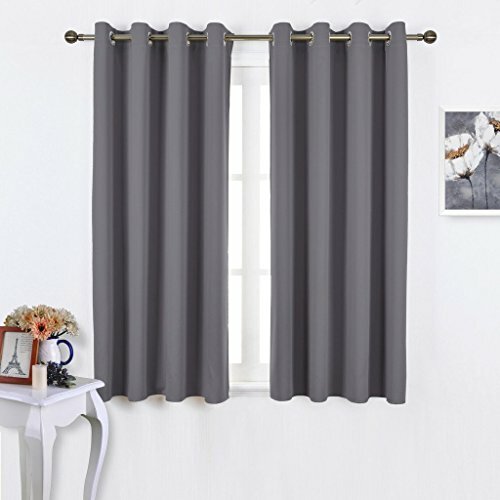 Take a leap of faith and give it a go with the Deconovo Room Darkening Thermal Insulated Blackout Grommet Window Curtain Panel for Bedroom that bring to the table good quality materials and nice performances for a very good price. True, you get only one panel per package, but this gives you the chance to be more precise when decorating your bedroom. The curtains make a good job on reducing sunlight, no matter the time of the day. They also create a peaceful bedroom as they lower the outside noise level. You can definitely get a break in the middle of the day, no light nor loud noise to bother you. Additionally, the panels work as a thermal barrier so they keep warmth inside when it’s cold outside and the other way around for the hot summertime. They are easy to install and the 6 solid grommets are quite large, for more versatility. The fabric is 100% polyester and doesn’t need special care. It doesn’t wrinkle easily and is medium-weight. 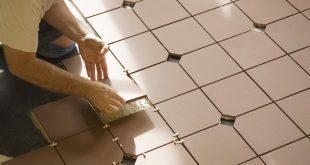 You may easily clean and take care of these panels. The fabric has a soft feel to it and looks nice in any bedroom. The fabric is also able to keep at distance dust or mites. You may safely use them for your baby’s bedroom as they keep allergens away from your baby. They are well made and the attention to details is impressive. The stitching is good and the curtains are long lasting. Despite the minor issues, we still think the Deconovo panels make a good buy as they bring good quality materials and pretty reliable performances. 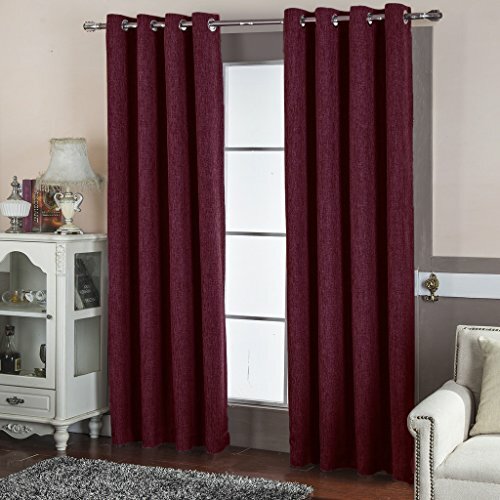 One thing is sure about the Nicetown 2 Panel Set Blackout Curtains for Bedroom /Living Room: you really can’t complain about not finding the right color as they come in a great number of vibrant, rich colors! The curtains are imported and made of polyester and hand rather well. They are able to stop almost 95% of light and bad UV ray and bring down the outside noise with 20% thanks to the triple weave technology used. The microfiber thermal coating on these panels is efficient on keeping a constant temperature in your room as it insulated against heat or cold. These blackout curtains become therefore able to create a good sleep setting during the day and the night as they darken the room and lower outside noise levels. Furthermore, they also create a nice privacy in your room so that you can watch some movies. They are ready to use right out of the box and don’t need ironing. They are thread trimmed and wrinkle free, which means less work for you. The curtains come with tough grommet ring, which makes the setup easy and fast. They are thick and have a nice feel to touch. Overall, for a fair price, you get some nice looking panels that not only darken your room, but also bring down the outside noise and need less maintenance. 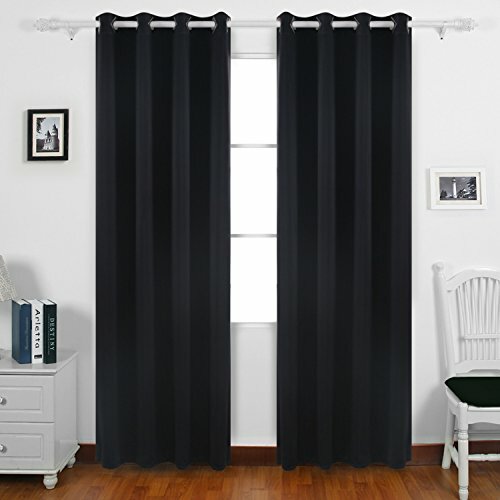 When you get blackout curtains that also look nice, it’s quite a bonus, and this is the case of the Deconovo Solid Color Grommet Top Blackout Curtains. The two panels keep most of sunlight away from any room, all throughout the day and don’t let all the outside noise get inside. This way your room becomes darker and quieter. The heat is kept inside during the wintertime and the room doesn’t get hot during the summer thanks to the insulated abilities of the curtains. The material used on the curtains not only looks nice (the colors are rich and bright), but it’s also thick and heavy, hanging quite well. Despite the thickness, the panels have a nice soft feel and create a nice vibe in any room. They are made of 100% polyester and have a silky, elegant appearance, with no loose threads. 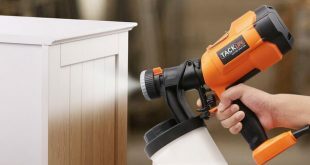 They don’t attract dust/ mites so are a good option when fighting the allergies. The material is long lasting, not flimsy and has a nice flow. 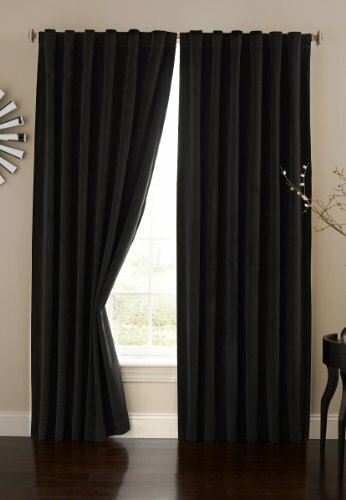 The curtains are easy to install and the grommets that come along are solid and quite large, for more versatility. They arent’ difficult to take care of as they are machine washable, but only tumble dry on low if in need. Last but not least, the curtains come with matching tiebacks, which makes setup so much easier. Despite the minor issues, we still think the Deconovo panels are not only great for blocking sunlight, unwanted noise or allergens, but also look quite elegant. Sometimes you don’t have to pay the extra buck in order to get some good quality curtains. You can still get efficient ones without paying too much, like is the case with the Sound Asleep Room-Darkening Noise-Reducing Backtab Window Panel. Actually, you get to buy the official curtain of the National Sleep Foundation. The curtains feature Thermaback coating that keeps intrusive light and noise at distance. They have a good build and are heavy weight so they hang well. They are easy to clean and are made of a nice, versatile and textured woven chenille fabric. The back tab valance may be hung as rod pocket or back tab, depending on your needs and likings. The ascot valance fits a rod pocket sized from 2 ½” to 3”. 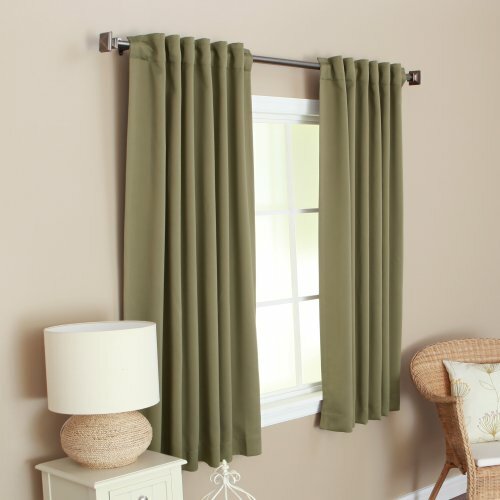 The curtains come in a good variety of colors (10) and various lengths just as well. They have no specific smell. As for the efficiency, they are able to keep light away and are pretty efficient when it comes to the noise reducing part. They are also efficient when it comes to keeping room temperature nice and preserved. The curtains are low maintenance and you may not only machine wash them, but also tumble dry low and low iron if you want. It’s better not to bleach them, though. 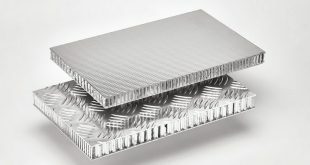 Despite the minor issues, we still think the Sound Asleep panels are worth to try as they keep unwanted light and noise away, for a very good price. The Yoja Thermal Insulated Noise Reducing Heat Blocking Drapes are not only easy to install, but also give you the privacy you want for your room. The curtains are made of 100% polyester and they have an elegant appearance as the back of them is of the same fabric as of front. This makes the curtains even more energy efficient so that your room preserves a pleasant, constant temperature no matter the season. They are keeping most of the sunlight away no matter the time of the day so you get a nice afternoon sleep. The outside noise level is also lowered and the room gets quiet and peaceful. The fabric is in fact densely woven which makes it able to lower the external noise of 10-20dB. 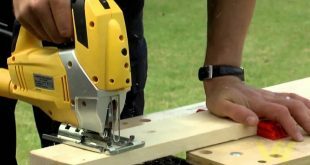 They come with 8 grommets that are solid and large enough for more convenience when installing. The fabric is good quality that doesn’t need any special treatments. It has a soft, silky feel and doesn’t need ironing. You may wash it with warm water (don’t use water hotter than 30C degrees) and also machine-wash them when in need. It’s better not to use the dryer nor do the hot iron them, though. The curtains look nice and the color run true. We try to see the big picture though and we think the Yoja panels are a nicely colored, noise reducing option that you may try. 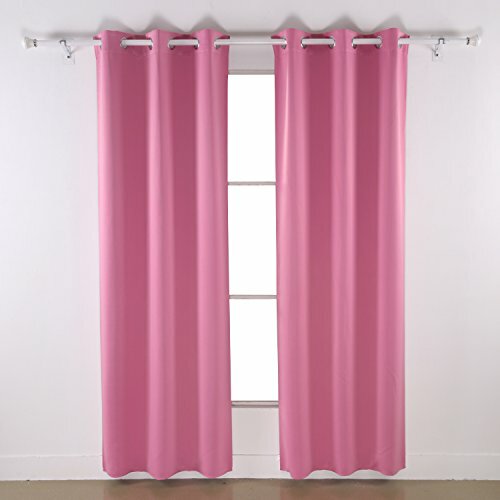 If you are looking for low-priced curtains that are quite efficient when it comes to create a nice, silent room, keeping the unwanted outside noises away, give it a try with the Flamingo P Microfiber Noise Reducing Curtains. The curtains are made of 100% polyester and they manage to block 97% of the sunlight. The thermal-insulated material not only blocks light, but also preserves the nice temperature in your room. The outside noises are minimized and you get a nice, quiet sleep until later in the day. The curtains are made of thick, yet nice to touch fabric. Each panel comes with several solid, large grommets. It’s easy to install them and they hang elegant. They are easy to maintain and they are dry clean only. You may machine wash them, but you should use a mild liquid laundry detergent. In order to expand their durability, it’s better not to use hot water nor bleach. Warm ironing should complete the maintenance. 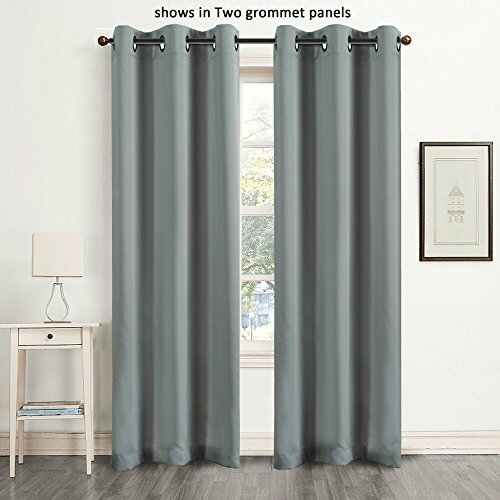 The grommet-top curtain is quite long and it’s able to block out floor-length windows and door so that no light disturbs your afternoon nap. Keep in mind the computer monitors may not give the best accuracy for the colors. The curtains come in several color options. Despite the minor issues, as they are low-priced and efficient when it comes to creating a darkened, noise-free atmosphere for an afternoon nap, the Flamingo P panels do make a good choice. If you like the classic appearance, but the new era technology for your bedroom curtains, give it a go with the Dreamcity Room Darkening Thermal Insulated Noise Reducing Curtains. You get one pair with 2 panels and they look quite nice and elegant in any room. The curtains are able to keep at distance at least 90% (light color) and 98% (dark color). Your room gets quieter as the curtains lower the outside noise level. It also gets warmer in the winter and cooler in the summer as the curtains are also thermal insulated, saving energy for heating and cooling. They aren’t made of popular polyester, but of high-end faux linen fabric. This is why they hang so well, no wrinkles and very little need of ironing. They have thread trimmed and combine very pretty with the silver grommets. The grommets are placed evenly and are tighten to the fabric. 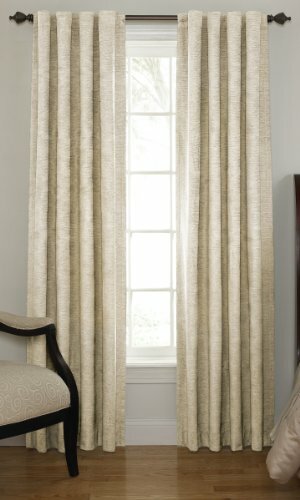 The curtains not only look nice, but also have a nice texture. They are very well made and are thick enough to darken your room. They have a simple, yet elegant, design and give an expensive touch to any room. The colors run true and the curtains need minimal care. The minor issues aren’t deal breakers for us though and we think the Dreamcity panels make it as a good option when you want a simple, yet efficient look for your room. Give your bedroom the privacy you’ve always wanted with the Aquazolax Pair of Noise Reducing Solid Ring Thermal. As much as we enjoy the morning sun, sometimes you just want to sleep in and the curtains are keeping at distance more than 90% of that bright, shiny morning light. 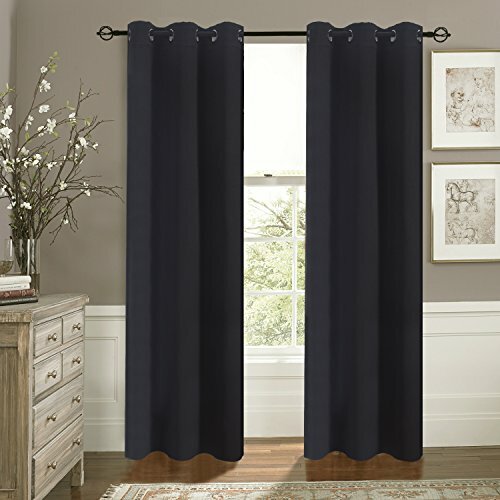 This set of noise canceling curtains contains 2 panels that are made of polyester so they are easy to maintain and need no ironing. They are thread trimmed and ready to use right out of the box. 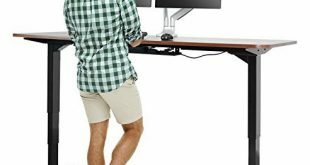 The setup is very easy and the large grommets increase their versatility. The grommets slide nice and smoothly through your curtain rod. When it comes to real performance, we notice the curtains are able to black out more than 99% of the unwanted exterior light, minimize outside noise. 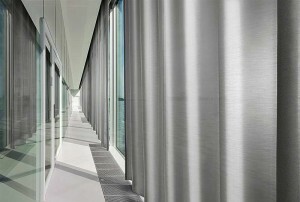 The triple weave technology is efficient in this case also and the curtains offer insulation to your room. In addition, the intimacy you get is always a bonus. They come in solid colors and have same material on both sides. The fade-resistant fabric also preserves the colors on your rugs, furniture as it’s blocking 100% UV rays. The list of features continues with the minimal care needed by these panels. They need only machine wash cold on gentle cycle, tumble dry low. You simply hang them to dry and cool iron when in need. To expand their life span, it’s better not to bleach them. The curtains look amazing, elegant and hang nicely in your bedroom. Apart from the minimal issues, we really like the Aquazolas curtains, as they are functional and looking altogether.